It is not everyone who is offered the opportunity to pull their Chevrolet Silverado into General Motors Flint Assembly plant on VanSlyke Road and meet the workers who made it. But, when you are the owners of a 2006 Silverado that passed the million mile mark in just six years, you are welcome to drive right into the plant, meet the workers, and receive heart felt congratulations and gifts. That was exactly the case Friday for Hugh and Tammy Pennington of Delton, Michigan – a town between Hastings and Kalamazoo. The long ride that led the couple to million-mile milestone followed Tammy Pennington’s lifelong passion. Tammy, a former computer programmer for a grocery store chain, said it was her love for traveling, and her desire to help out after the Hurricane Katrina disaster in the south that spurred a new driving adventure for her and her husband. In June of 2006 they purchased a brand new Chevrolet Silverado 3500 HD crew-cab with a Duramax diesel engine and Allison transmission while in Georgia. The first trip in the new Silverado was a vacation in Michigan. Then it was back to hauling Federal Emergency Management Agency (FEMA) trailers. By November of 2006, they had changed their customer base and began hauling fifth wheels and trailers from factories to dealers for the Indiana Transport Company. Intermixed with their hauling were many long-distance vacations to northwest Canada and northeastern U.S.
Tammy Penningston, who says she was behind the wheel for 90 percent of the driving, says she remembers clearly the moment on April 4, 2012 when the odometer moved past the million-mile mark on their Silverado. Today, she says, the odometer reads about 15,000 miles. Many have asked the Penningtons how it is possible to put on more than a million miles on a vehicle in a six-year period. Tammy says she has tried to do the math. “I figure you would have to drive 474 miles per day every day for six years without stopping for a day to get to a million miles,” said Tammy Pennington. But that’s not how the Penningtons accumulated their million miles. Tammy Pennington says when they are hauling trailers for other companies they sleep in the back seat of the Silverado, by pulling down the seats and laying a queen-size mattress on top of them. But Hugh Pennington points out that they often travel in comfort. The Penningtons say their Silverado has been a workhorse, with seventy percent of the miles put on the vehicle hauling miles. Over the past six years of its life, they say it has had tires changed twice a year and oil changed every 3,000 to 4,000 miles. The most significant repair costs over the six years, they say was $7,000 for a transmission and transfer case when they passed the 850,000 mile mark in June of 2011. The Penningtons’ advice for longevity of a vehicle boiled down to what they the call the basics: regular maintenance, and making sure you have a good working relationship with the mechanics taking care of your vehicle. She also offered some advice for General Motors designers who work on the vehicle. “The only thing I found that I would change was a bad design of two little radiator hoses that have popped every once in a while,” said Tammy. But they expressed overall praise for the truck that brought them to Flint for a visit and will continue as their personal and business vehicle in the future. “Maybe we’ll still be driving it after 2 million miles,” said Hugh Pennington. “It is sign of the quality that now goes into these vehicles,” said UAW Local 598 President Ray Gorney who represents the workers who built the vehicle driven by the Penningtons. Gorney pointed out that much has changed at Flint Assembly since he began there in the 1970’s. Behind the scenes, in wind tunnels, design studios, labs and on the test track, General Motors Co. engineers have been working the past few years to develop the all-new 2013 Chevrolet Malibu, which hits the streets this year. 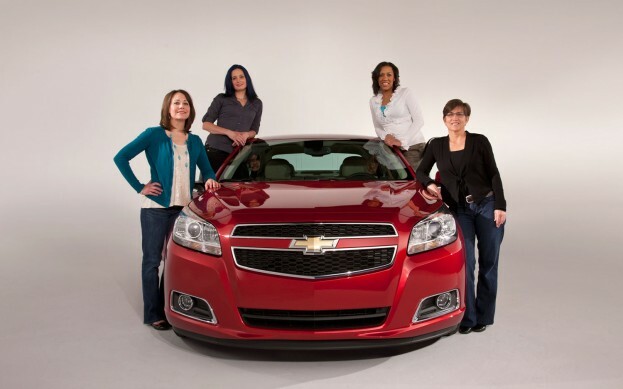 To get the vehicle just right, GM tapped four of its female engineers — and moms, too — to help redesign the Malibu. The popular family car will be sold not just here in the U.S., but around the world in nearly 100 countries. Women buy slightly more than half of cars in the U.S. and participate in 80 percent of family car-buying decisions, according to industry statistics provided by GM. It’s not uncommon for automakers to turn to women engineers to help design vehicles, auto industry experts say. The new Malibu, GM’s first global midsize sedan, has special touches from women engineers who ensured the gamut of child safety seats work in the vehicle, helped boost fuel economy and made it quieter so moms — and dads — can hear their children in the backseat. And these engineers aren’t who you might expect. Single mom and aerodynamics development engineer Suzanne “Suzy” Cody and a colleague spent more than 400 hours in the wind tunnel at the Warren Tech Center to reduce drag on the car. Cody, who sports blue hair and in her spare time laces up roller skates to compete as “Shovey Camaro” with the Bath City Roller Girls, led efforts to make the car more slippery through the wind, which helped gain 2.5 mpg in highway driving over the Malibu’s predecessor. As a mother of two young boys, Cody said fuel economy is important to her and she knows how important it is to families. The new Malibu also uses new materials to help it earn the Malibu’s quietest title to date. Materials were placed behind the instrument panels, in panels, doors and in carpet to absorb noise. The Malibu also uses acoustic laminated glass to cut noise from big semis that zip by and interrupt conversations with kids, said Kara Gordon, a vehicle performance engineer for noise and vibration acoustics. “We’ve got voice-recognition technologies, we’ve got all this stuff we’ve loaded into the car and if it’s not quiet enough, it won’t work,” said Gordon, who spent hours in a lab listening to Malibu noise recordings. The 2013 Malibu Eco, which features eAssist technology to boost fuel economy to 25 mpg city and 37 mpg highway, is already on sale, with a starting price tag of $25,995. In April, it sold 1,600 units. Additional Malibu models will be on sale later this year. Child safety engineer Julie Kleinert, a 27-year engineering veteran who tests child safety seats and works to improve interior designs to more easily accommodate them, also tested the air bags in the new Malibu. The mother and grandmother also volunteers with Safe Kids USA’s Buckle Up to teach people about proper child seat installation. “Three out of four car seats are not installed correctly,” she noted. The Malibu’s Vehicle Line Manager, Tracy L. Mack-Askew, has already logged nearly 40,000 air miles in the past year flying back and forth to Kansas to GM’s Fairfax plant to ensure Malibu production happens on time. The Malibu also will be built beginning this summer at GM’s Detroit-Hamtramck assembly plant. Jack Maxton Chevrolet will salute the nation’s active duty and retired service members in May by providing an exclusive “Honor” badge to customers who buy an eligible vehicle through the General Motors Military Discount program. During Military Appreciation Month, Jack Maxton will install, free upon request, the exclusive “Honor” badge – consisting of a yellow ribbon and “Honor” script – as a subtle recognition of military service to customers who buy an eligible Chevrolet through the GM Military Discount program. The GM Military Discount is available to active, reserve and retired members and spouses of the U.S. Air Force, Army, Navy, Marines, National Guard and Coast Guard. The discount, ranging from $400 to $4,000, is available on most Chevrolet cars, trucks and crossovers, depending on the model and options selected. The discount can be combined with most current incentives. Since 2010, Jack Maxton and Chevrolet have collected more than 103,000 lightly used devices for Cell Phones for Soldiers, and converted them to 6.2 million minutes of free talk time for troops serving overseas. Jack Maxton will be collecting for Cell Phones for Soldiers once again, through the end of July. Please call 1-877-331-1628 to get more information on how you can donate your old phones.